As a physician and teacher, I watch the news regarding health care. It is obvious to me that Congress is unwilling to tackle the complicated issues that providing health care for all demands. Our Congress is content to let corporations provide the fragmented and expensive health care we are all acquainted with. Josh Harder, a candidate for California’s 10th Congressional District, is committed to seeing health care access for all become a reality. Josh is the fifth generation of a Valley family who graduated from Modesto High School’s prestigious IB program, earned his degree from Stanford in economics and public policy. He is an experienced businessman with expertise in small business start-ups and technology. Josh understands the modern economy and what it will take to make health care affordable for all. Josh is smart, young, energetic, personable and has enough humility to know he will have to work hard to fulfill his promise. In the past four months that Jeff Denham had an opportunity to push through a clean Dream Act to help his Latino constituents, he hasn’t taken one of these opportunities to do the right thing. Denham’s district is over 40 percent Latino and he continuously tells the Latino community that he will fight for them in Washington, D.C. But when Denham casts the vote, the vote almost always opposes the interests of his own constituents. I am standing with Josh Harder in June and again in November. He is a strong friend of the Latino community. He was the only candidate or elected official to show up to the two DREAMers rally. No other candidates or Denham were there. Josh has been vocal about fighting for a clean DREAM Act and fighting for comprehensive immigration reform. Josh Harder is honest, strong and as the frontrunner on the Democratic side, he will be the best person to represent this district in Congress. A vote for Josh Harder is a step forward for Latinos, DREAMers and ethical politics. The Central Valley raised me, educated me and molded me into the person I have become. District 10 has been my home for more than a decade now and the thought of having to leave in order to find a job is daunting. As a Stanislaus State alumnus I have created connections I will remember for a lifetime and I understand the importance of a cohesive community. This district needs more jobs, better opportunities and most importantly different representation in Washington. As a native of the area, Josh Harder shares the same love for our home and understands the importance of coming back to help your community. His education and experience have given him the tools to proactively address the issues faced by this district. Josh Harder is what the valley needs. 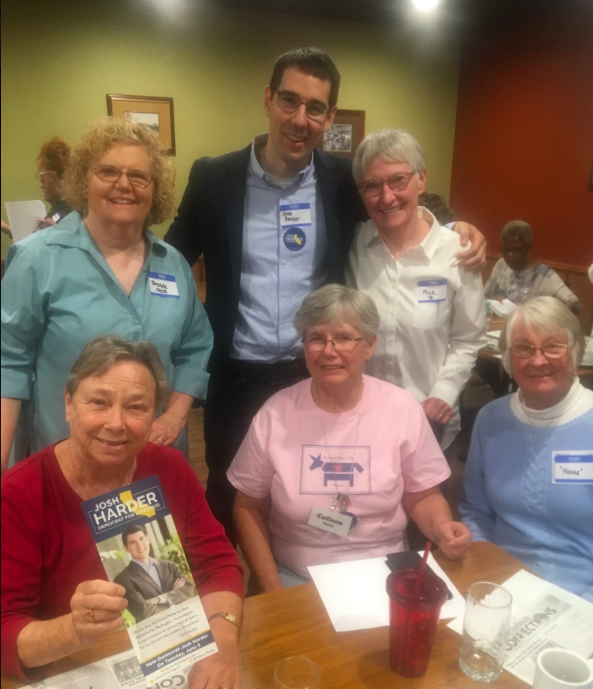 The reason I am supporting Josh Harder for Congress is one word: Inclusive. I met Josh at his first workshop meeting and wanted to see for myself if this guy is for real. Not only did make it his main focus to include everyone, Josh understands the importance of respecting constituents. I’m voting for Josh Harder for Congress on June 5 because I believe District 10, like the rest of the San Joaquin Valley, needs a fresh start. Josh is a young, successful Turlock native who will bring innovative ideas and expertise to an area long overshadowed by its neighbors to the west. Josh isn’t part of the old guard, steeped in allegiances, traditions and a vision that has held our district (among others) back from many of the social, technological and humanistic advances enjoyed by citizens of surrounding communities. Josh is the perfect counterpoint to the old worn out policies of exclusion and greed exemplified by our current congressman, Jeff Denham. Let’s see what the upcoming generation can do to turn around the failures of our out-of-touch leadership in Washington today. I am in support of Josh Harder for California’s 10th congressional district. Josh recently had a rally at his office after he won the Democratic bid to run against Jeff Denham. His office was so full of volunteers that we were sitting on the floor. Josh is a young, dynamic, hard worker. Please consider supporting Josh Harder for congress as he is in support of affordable health care for all, affordable education including tuition free community college, helping small businesses and farmers succeed, a sustainable water future and a fair, humane immigration policy. Josh believes we should all have a voice and hosts regular town hall meetings, which have been sadly lacking from Jeff Denham’s term in office. Come on over to Josh Harder’s campaign and help us get him elected. If you believe your representative in Congress should be available for town hall meetings, to listen to your concerns, vote for Josh Harder. Your representative should be willing to face you. There are many issues facing us right now that need more than a rubber stamp vote by a Trump puppet. The economy, immigration, healthcare and the environment are at the forefront of complicated policies important to our valley. Your congressman should vote for what is best for the valley, not his donors. Vote for Josh Harder in November, who’s only allegiance is to the voters who elected him. If you are not registered to vote, register. If you are registered, vote. Your vote matters.